Welcome! This blog is for all people who love teaching English/Language Arts. Our bloggers share insights, motivational messages, and practical teaching strategies. We hope our posts will inspire you as you encourage your students to love their language and to wield it well! In this post, we are continuing our series on strategies for helping students connect grammar and writing. This week's focus is parallel structure. In order for students to understand parallel structure, it's important for them to see the parallel parts of a sentence. Not Parallel: Creon is a hypocritical character who is more concerned with his reputation and power than making the right decision. Parallel: Creon is a hypocritical character who is more concerned with his reputation and power than with making the right decision. Not Parallel: This symbolism not only shows the care Karla has for the relationship but also for its broken fragments. Parallel: This symbolism shows the care Karla has not only for the relationship but also for its broken fragments. As an added challenge, you can ask students to diagram one of the “not parallel” sentences and its corresponding “parallel” sentence to help them visualize the structure. Finally, have students look through their drafts of a current writing assignment and focus on parallel structure. They should follow the same process as in the practice exercise above so that they can correct problems with parallel structure or provide evidence that they don’t have such errors. This type of annotation will show you without question which students understand and which ones still need more practice. Tune in next time for another specific strategy for connecting grammar and writing in your classroom! Daily Grammar Practice is a meaningful, effective approach to teaching grammar for all grade levels. 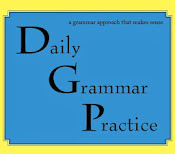 Click on the picture for an informational video showing Daily Grammar Practice in action. Daily Reading Practice provides students in grades 1-10 with regular, indepth practice with comprehension, summary writing, and informational texts. Daily Spelling Practice offers a systematic approach to teaching students of all ages HOW to spell. Dawn is a National Board Certified Teacher who has taught middle and high school English since 1990. In addition to English, she is also certified in gifted education for grades K-12. She is the author of Daily Grammar Practice as well as numerous other publications for teaching language arts. She received the NCTE High School Teacher of Excellence Award for 2005 and was a 2007 finalist for Georgia Teacher of the Year. Dawn teaches professional development courses and has presented at countless conferences. Judith Holbrook is a retired teacher with 30 years of experience in elementary and middle grade education. She has taught in Illinois, California, and Georgia. She has her BS in Education from Eastern Illinois University and her MS in Early Childhood Education from the University of West Georgia. Judith has published grammar, reading, and writing curricula for grades 1-8; co-published a children’s newspaper; presented many workshops at professional conferences; and taught professional development at schools around the country. © DGP Publishing, Inc. Simple theme. Powered by Blogger.